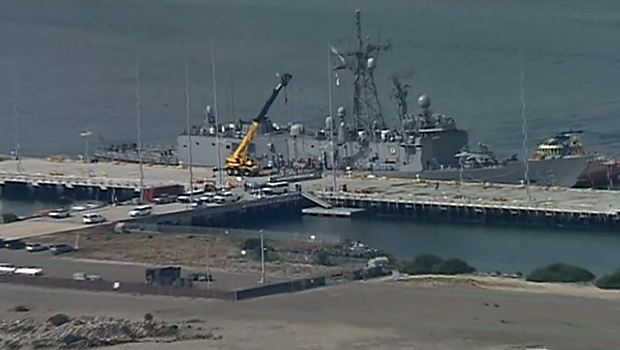 SAN DIEGO -- A Navy warship carrying a family whose sailboat broke down in the Pacific Ocean with a sick toddler arrived on Wednesday in San Diego. The arrival came six days after Charlotte and Eric Kaufman called for help on their satellite phone from 900 miles off the coast of Mexico when their sailboat broke down and their 1-year-old daughter Lyra was vomiting and suffering from diarrhea and fever. Rescuers reached them Thursday, with California Air National Guard members parachuting down to the 36-foot sailboat. The girl quickly responded to new medication for her salmonella-like symptoms. Her 3-year-old sister was also on the boat. The warship carrying the family docked at Naval Air Station North Island, Navy spokeswoman Lt. Lenaya Rotklein said. The Kaufmans did not wish to speak publicly. They want to tend to their daughter first and get some rest, Charlotte Kaufman's sister, Sariah English, said. The Kaufmans' decision to sail around the world with Lyra and her sister Cora has struck a chord with parents - angering some who accuse them of endangering their children and drawing admiration from others for having the courage and determination to follow their dream. "The rescuers have to risk their own lives to help people who do these kinds of stupid things on purpose, and I don't think that's right," said Margaret Dilloway, a San Diego novelist who has three children, adding that she thinks the family should have to foot part of the bill for the rescue operation. Who pays for expensive ocean rescue operations? CBS News correspondent Vicente Arenas reports that the four federal agencies involved in search and rescues - the Coast Guard, the National Park Service, the Defense Department and the Federal Emergency Management Agency - will only bill someone if a hoax is involved. "The last thing we want you to do if you are in distress is to weigh whether or not you can afford it because you're afraid we're going to come after you for reimbursement," Coast Guard Lt. Cmdr. Gabe Somma told Arenas. Somma is a rescue pilot in Miami, the busiest sector in the nation for the Coast Guard. It can cost about $11,000 an hour to fly their choppers. The Coast Guard's largest search aircraft, the C-130, can cost $20,000 an hour to operate. Dilloway said, "They'll probably go on the 'Today' show to talk about this, and write a book about it, do a mini-series and get 15 minutes of fame because that's how our country tends to reward people who choose recklessly to put themselves and their children in danger." English doesn't question their decision: Sailing is their passion. It's what defines them. The family had lived aboard the sailboat, Rebel Heart, for seven years before it broke down. Rescuers had to sink it because it was taking in water. "People are going to criticize anybody's parenting of their children," she said. "Charlotte and Eric raise their children how they see fit. They are very concerned about child safety. That's their No. 1 concern and they did not do this blindly. They are responsible, good parents." But they are aware of the criticism. Eric Kaufman, a Coast Guard-licensed captain, and his wife sent a statement from the USS Vandegrift defending their actions, saying "when we departed on this journey more than a year ago, we were then and remain today confident that we prepared as well as any sailing crew could." Others say children benefit in numerous, intangible ways from parents who show them the world, even at an age in which they may not remember the travels. Ivan Alba said they should be commended for having the courage to follow their dream. "I think it's a great thing, their decision to sail around the world, and just because their children are 1 and 3 years old doesn't mean they can't be on a boat," said the San Diego father, who is also planning a world trip with his wife and two daughters, 8 and 10. "I say more power to them. It's just too bad what happened, but that's also life. Anything can happen, anywhere." Charlotte Kaufman was pregnant with Lyra when they set off from San Diego. They stopped briefly in Mexico for the birth. The baby had salmonella in Mexico but her pediatrician had assured them she was over it and safe to travel when they set off again on their voyage last month, English said. But shortly into the trip, she started showing symptoms and did not respond to antibiotics. Then the Rebel Heart lost its steering and communication abilities. The Kaufmans used a satellite phone to call for help Thursday. It took three federal agencies, a fixed-wing aircraft, a Navy warship and scores of personnel to rescue the family. The Navy, Coast Guard and California Air National Guard don't charge for search-and-rescue missions so as not to not discourage people from calling for help. Rescuing people also is a requirement of international maritime convention. English, who spoke to her sister after the rescue, said her niece has become a healthy, happy baby again with new medication. The girl is expected to see a doctor in San Diego to get a diagnosis of the illness. "For now, they just want to focus on Lyra and get their feet back on the ground," English said. "But honestly I'd be surprised if there was not another sailing adventure in their future. I'm just not sure how soon."